Coordinated vehicle charging delays add up to significant demand response capacity. Julian is a staff writer at Greentech Media, where he reports on energy storage, solar power and other clean energy sectors. He also has experience covering clean transportation, state and federal energy policy, and climate adaptation. Previously, Julian reported for CityLab at The Atlantic and conducted grant-funded climate change reporting in Bangladesh. He graduated from Duke University. EMotorWerks aims to prove that EV chargers can pay for themselves with grid services revenue. It’s time to stop using the future tense to describe electric vehicle chargers as a clean grid resource. The Enel subsidiary eMotorWerks has mobilized a fleet of 10,000 connected car chargers to participate in California’s day-ahead markets. When the industry talks about virtual power plants, the phrase typically refers to networks of energy resources aggregated to deliver meaningful capacity. The eMotorWerks platform operates a little differently: It rearranges vehicle charging schedules across thousands of chargers to deliver reductions in electrical consumption for California’s proxy demand resource (PDR) market. That’s the California ISO product used by distributed storage companies like Stem to monetize batteries across many different customer sites. But this is the first time a large-scale network of electric car chargers has played that role, at least in the U.S. (PG&E has teamed up with BMW to pilot a similar concept with a few hundred EV drivers). It’s not surprising that it came first to California, which has led the U.S. in EV purchases. If the fleet performs the way CEO Val Miftakhov thinks it will, this could open up a new financing structure for EV chargers, where vendors use future revenues to drive down the upfront cost of the infrastructure. The PDR mechanism compensates companies that reduce electrical consumption compared to historical trends. Companies do that with thermostats or by tweaking industrial activities. EMotorWerks does it with cars, but it can also control other energy devices. The company oversees more than 10,000 electric vehicle chargers in California and can delay charging schedules across that fleet based on a signal from the grid operator, while factoring in drivers’ needs and letting them opt out of events if necessary. Drivers earn compensation based on the flexibility that they provide. Of the 10,000 chargers, 6,000 have been installed since the start of 2017, amounting to 30 megawatts of flexible capacity. The total capacity at the company’s disposal changes by the day, however. The fleet has been bidding and dispatching daily in the California grid. In August, the chargers logged 974 hours of dispatch at an average price of $50 per megawatt-hour, Schlosberg said. The company is entering real-time markets this month. The hard part for an aggregator is knowing how much demand can be wrung out of the chargers, while accounting for the needs of individual drivers. “We have a statistical perspective on the capacity that we have certain confidence intervals around, and we bid accordingly,” Miftakhov said. The company also licenses its JuiceNet software to power providers, including Xcel Energy and Sonoma Clean Power, to run their own EV demand response programs. Before this current incarnation, eMotorWerks won spots in the first and second rounds of the Demand Response Auction Mechanism, though not in the most recent round. The company now is participating directly in PDR, outside of the DRAM structure. Currently, eMotorWerks calculates that participating drivers will earn $40 to $80 per year for their willingness to delay charging. That’s more than nothing, but it’s not a major cash generator, especially compared to the outlay needed to buy an EV in the first place. Miftakhov expects that payout to grow as the company enters more grid services markets. The fleet could serve frequency regulation, he said, but regulatory and market barriers make it uneconomical today. Market opportunities are likely to develop in the coming years, because California has committed itself to 100 percent carbon-free electricity by 2045. That policy will produce an influx of intermittent renewable energy, which will heighten the value of rapid-response, highly controllable tools for grid operations. Already, the charger network’s dispatches tend to drive consumption away from peak hours, when gas peakers fire up, to times when solar and wind power provide abundant electricity. “It does a really great job of cutting off the neck of the duck,” Schlosberg said, referring to the "duck curve," the unique net load curve resulting from California’s solar build-out. That shifting will have to unfold at a massive scale if California wants to shut down its gas plants for good. EMotorWerks started off selling smart chargers when EV infrastructure was still new, much like the energy storage companies that had to build early projects in order to deploy their software. Once a critical mass of infrastructure has been built, it creates opportunities to aggregate, and therefore to deliver higher-value services. Already, more of the company's revenue is coming from software licenses and market participation, Miftakhov noted. “We’re moving more and more toward that,” he said. If this grid services opportunity proves to be as lucrative as Miftakhov thinks it will, it would change the barrier to entry for electric vehicle infrastructure. Mass adoption of EVs requires mass deployment of infrastructure to charge them, which is costly. Miftakhov wants to make that easier by monetizing future earnings to finance part or all of the deployment cost. This would be an EV version of the solar power-purchase agreement, in which investors pay upfront for future earnings of a distributed energy asset. Third-party financiers are already expressing interest, Miftakhov said, but they need to see a reliable record of revenues. EMotorWerks expects to have revenue data to show in the next six to 12 months. 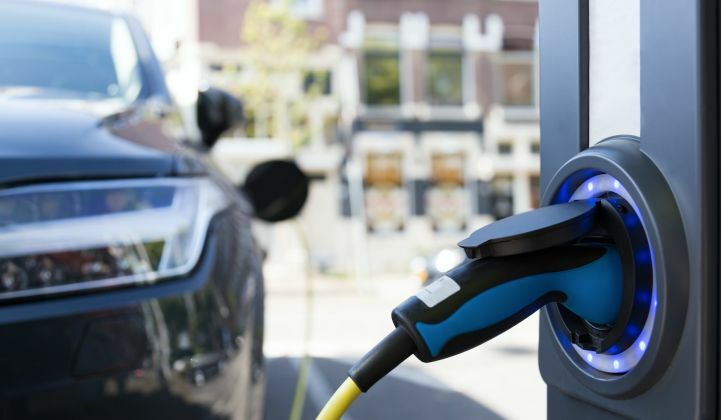 It’s too early to know if this will pan out, but what’s clear is that California policy will push a wave of EV adoption in the coming years, said Elta Kolo, research manager for grid edge at Wood Mackenzie Power & Renewables. Meanwhile, the increasingly renewable grid will require finer-tuned demand response tools, of the sort EV charging portfolios can deliver. “It’s going to be closer to real time, and it’s going to be able to mold around the ramping rates you need,” she said, comparing these new tools to traditional demand response.